Honesty and truthfulness are two core values I live by. With that said, I can not lie and must say when it came to today’s run, I was dreading it. The weather forecast called for 60% chance of rain and temperatures in the mid 60’s to lower 70’s – wet, humid, ugly day. What was dread quickly turned to joy when the clouds parted, a nice breeze picked up and the sun came out. It was a lovely day to run after all! My long run called for 16 miles – the first 10 miles easy in zone two and then picking it up the last 6 miles running at race pace. My metabolic training is paying off – I was able to run – not run/walk – the first 10 miles and keep my average heart rate at 130 – 3 beats under my zone two threshold of 133. Then came the last 6 miles – I ran race pace the first two miles. At this point I am 12 miles into my run, right where most of my longest long runs over the past three years ended. Training for half marathons has also trained my hamstrings to going into a burning rage past 12 miles. The final four miles I ran faster than the first 10, but not at race pace. I still have several long runs before the marathon to train my legs to go the distance. It was during these last four miles that I also used my mantras – I Believe I am able, I know I can do this. And I did. The California International Marathon (CIM) is a flat to slight downhill course so I ran on the towpath in the Cuyahoga Valley National Park. With the sun shining and the trees near peak color, I had beautiful scenery my entire run. A crushed limestone path, a flowing river, beautiful trees, and a leaf covered path made it all the more enjoyable. The leaves did cover one thing I didn’t expect – a snake. Garden variety I am sure, but I am not a fan of snakes. I hopped over the critter on my way out around mile 12. On my way back as I was finishing mile 14 it had made it across the path and slithered right on to my shoe as my foot landed. While I was tired and my legs hurt, I had enough adrenaline in me to yelp, hop, and fling the critter across the path. Nearly landing on the cyclist approaching me. Never a dull moment. So I had a few surprises on my long run today. Pleasantly, the weather surprised me and provided a lovely day to run. A snake decided to sneak up on me – twice – to make sure I was paying attention – two surprises I could have done without. But most of all I surprised myself – I made it through the last leg of a tough run, I dug deep to remember my mantras to get me through the hard part, and I finished strong. Believing in my ability – I WILL do this. After my run I visited with my dad and then came home. Before going inside I went across the street and sat on the edge of the lake I live on. 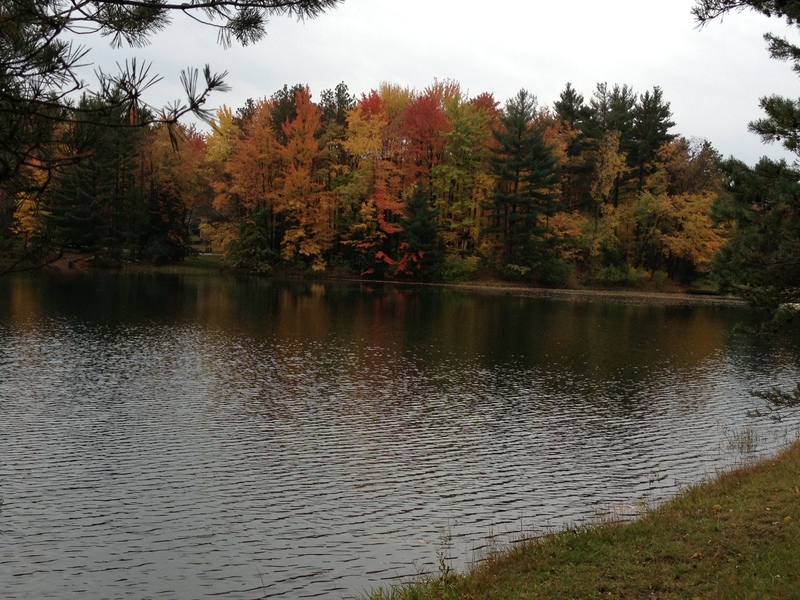 My blog banner has a picture I took a few years ago of the foliage. My day was capped with the most beautiful view – another pleasant surprise on what should have been a terrible day. Here was my view. My favorite part about living “so far out there”.